A rarely seen look at answering the questions associated with these terrible lizards—from a creationist perspective. Internationally known author and speaker Ken Ham brings a new way of thinking to the table for Christians, emphasizing that in order to properly understand our world we must first look at Scripture. By going to the Bible first for answers, we begin to understand that the dinosaurs were alongside man from the beginning. Complete with stunning, computer-generated illustrations of dinosaurs, this book promises to be a mainstay of any family library. 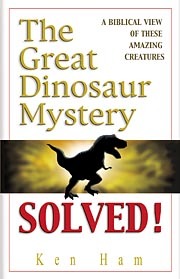 Purchase The Great Dinosaur Mystery Solved! This page was last modified on 23 June 2010, at 22:19.